a tradition at bountiful high during football season is to have a "big guy" dinner every wednesday night at someone's house. tonight it was my turn. anyone who plays on either line is invited to big guy dinner, however, there are always interlopers. we had the same thing tonight that we had when i hosted dinner for thomas and evan--hawaiian stack-ups and chocolate cake. i hope this is the last big guy dinner i ever have, not that i didn't enjoy having the boys over, i just don't enjoy football at bountiful high. i feel it's safe to reveal this problem. now that jake is no longer contagious. jake had an alarming rash on his forehead. then it spread to his arms. then it spread to his nose. the forehead was the worst though. last night was pretty much my line. 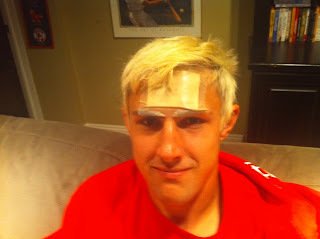 when jake came home from football, his forehead was covered in bloody sores. so off to kids care we went. the diagnosis was impetigo, which is a staph infection of the skin. it took the doctor exactly ten seconds to diagnose the problem and send us out the door with two prescriptions. she may have also said that jake couldn't go to school or football today because he was very contagious. anyone who has ever had kids play football knows that you can't miss football. if you want to play in the next game that is. so i made a totally irresponsible parenting decision. i covered every sore with a bandage and sent him to football. if he hasn't spread it by now (eight days after the first sore), he's not going to spread it when every sore is well covered. 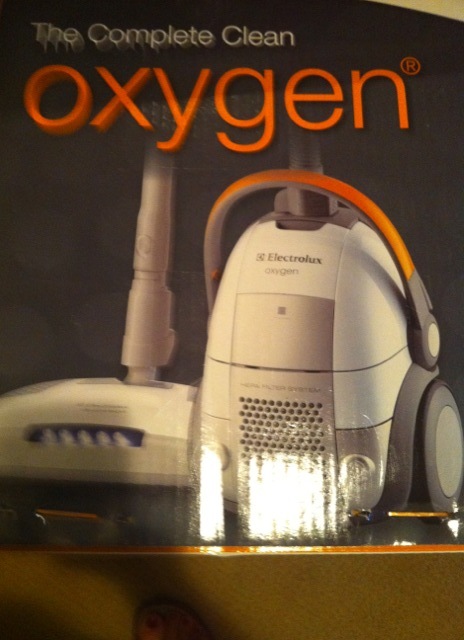 and he used alcohol to clean all his football equipment. he'll only be contagious for four more hours anyway. some of his friends on the football team suggested he go visit the logan high school team, our opponent this friday night. they'd all like logan to get impetigo. i was a little worried that the doctor would report us because her husband is a teacher at bountiful, but then i realized that if she told him that she saw jake, diagnosed him with a contagious rash, and banned him from school for the day, she'd be violating hippa laws and i would for sure win that battle. caroline is really enjoying high school. she loves her classes, especially ap euro, and she likes the social aspects of being around her friends again. she especially loves being identified as a parry--it seems that evan and jake are well known around the halls of bountiful high. 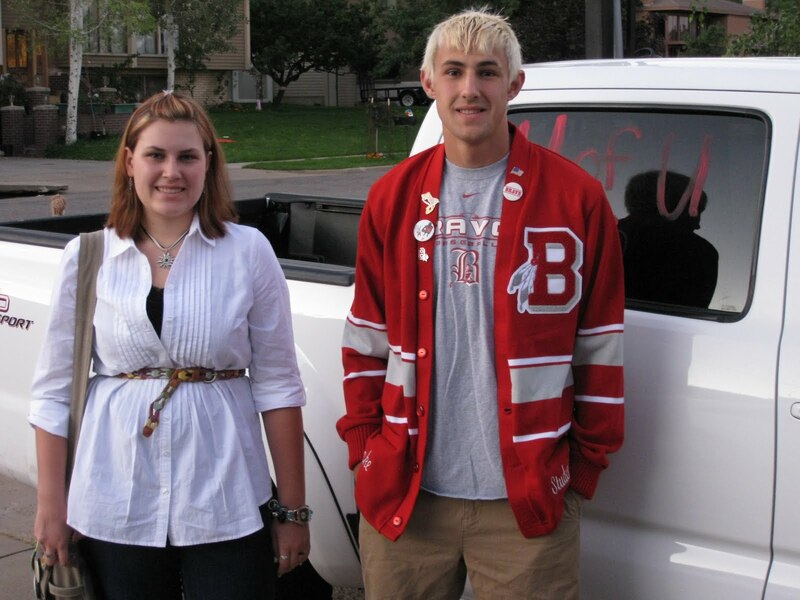 because jake is a senior and a student body officer, she is mostly identified as his sister. in fact, one of his friends started calling her "jips", which stands for jake parry's sister. others are catching on and now in some circles, she's not caroline so much as "jips". i don't think she minds though. got a new car. i am really so happy about it. 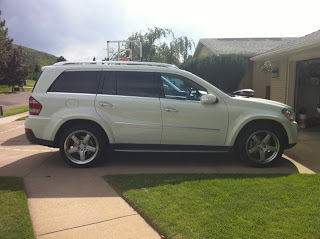 my suburban was just so big, i couldn't stand to drive it anymore. i'm almost always alone during the day now and it's such a waste to drive around that big car. also, it's kinda clunky, i mean it's really a truck. craig and i (with lots of help from my brother, steven) had been kind of looking last week, and we stumbled on this awesome car with hardly any miles on it that had just been turned in on a lease. i loved it. it's loaded. we drove it several times. then i went up to the cabin to spend the night with ryan and stacey. 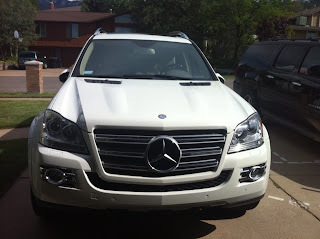 when i got home, this lovely white mercedes suv with a giant logo on the grill (that i love because who doesn't like to make an entrance) was in the driveway. i love it. thanks craig! one of the craziest summaries i've seen. jake said now he can tell his kids someday that he hit a home run in high school and scored a touchdown. he seems pretty happy about that. 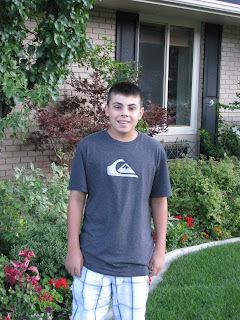 jake is a senior!? when did that happen? and caroline is a cute sophomore! she's gonna like being related to jake this year i think. vandals put those horrible u of u letters on the truck. if we catch them, their dead. didn't want anyone to think we converted or anything. isaac is a fifth grader. with white hair. i don't understand the need to change hair color when football starts in the fall. 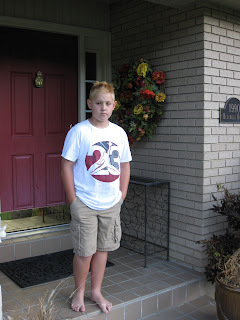 fortunately, sam likes his hair color and looks great for his first day of eighth grade. he's just happy not to be a "sevie" this year. we got proof tonight that evan is actually in japan. and that he is actually happy. everything went smoothly for parry choro and his four traveling companions yesterday. 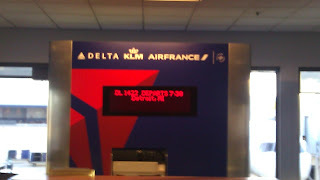 craig got to the airport as they were checking their luggage in. even though evan's bags were overweight by a few pounds, delta let him go without paying. this is the one and only time delta has ever done anything nice. 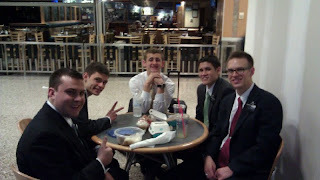 craig was able to go through security with the elders and, buy them some cinnamon roles for breakfast, and wait at the gate until they had to board. the rest of us got to talk with evan on the phone either from slc or from detroit (or both). god speed elder parry. we are really going to miss you! catch you on the flipside. i can't get evan off my mind today. i keep imagining how excited evan and his district are today. they get to leave for japan in the morning. finally. i imagine they must have spent a lot of time this weekend packing, sending stuff home, saying good-bye and i'm pretty sure not much sleeping will go on tonight, which will make for a super long day tomorrow. from this picture evan sent home from the mtc, it looks like they will leave the mtc around 4:30 a.m. i'm sure that ride will be bittersweet as they take in sights along the way--things they won't see again for 21 months. he seems ready, but it's bittersweet for me too. i like imagining him all tucked in tight in provo--only an hour from home. 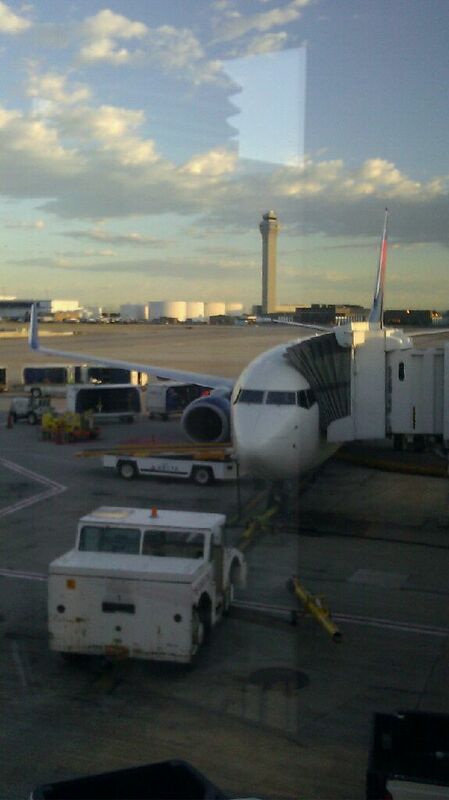 now he's off on a grand adventure to destinations unknown. can't wait to be part of his journey. 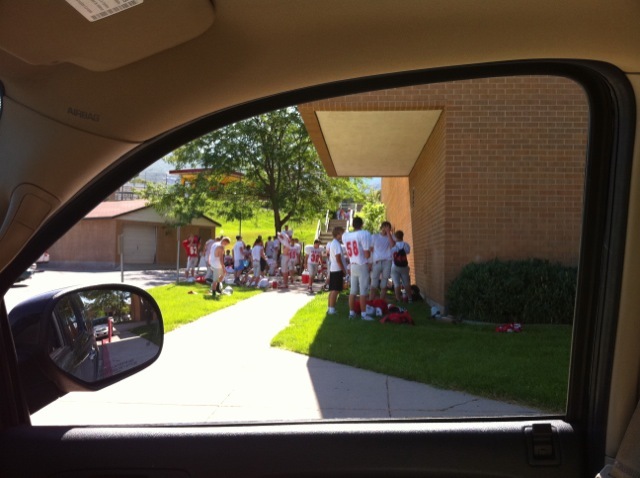 annual bountiful high scrimmage today! we always have a scrimmage the saturday after two-a-days end. i didn't go. too nervous. by all reports, jake played really well. he had two sacks and recovered a fumble at defensive end. it looks like he will be one of four defensive ends that rotate in every few plays. two ends play at a time. 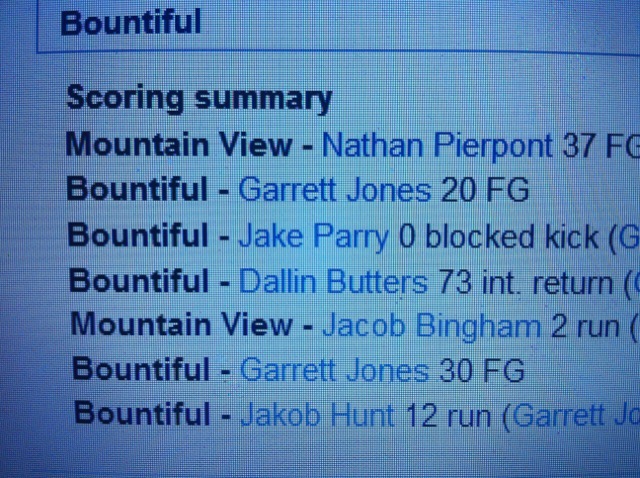 i still have a very mixed love affair with bountiful football, but hopefully this year will be fun for all. caroline, craig and i went to layton today to visit rod works, a store that always has fun stuff. i bought a side table to put in my sewing room hallway and a few doo-dads (is that even a word and is that how you spell it?). we made a quick stop at dsw to pick up some shoes for school. caroline had been driving but decided not to drive home so craig drove. fortunately. at one point some motorcycles, weaving in and out of traffic, passed us and were driving in front of us. one of the cyclists got to close to his friend, tapped his brakes and lost control of his motorcycle. he fell off, him going one way the bike going the other way, and then he skidded, rolling and bouncing across the freeway. luckily he went right or we would have run him over and killed him i'm sure. and luckily the bike went the other way or we would have been part of the accident. and luckily, a car wasn't coming up on our right. it was scary. as we drove on, we saw someone help the man up and he sort of walked off to the shoulder to safety, so he may be alright. golf would be the subject for sam every day if it could be. today though, the golf is about isaac. after their lakeside league ended yesterday, there was a final father/son tournament today. 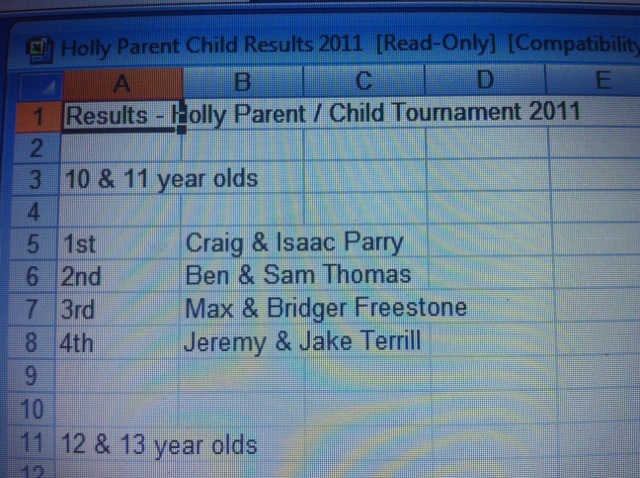 isaac and craig entered as a team. sam was going to play with his uncle matt, but had to bow out because of football. isaac is kind of a streaky golfer--sometimes good and other times not as good. 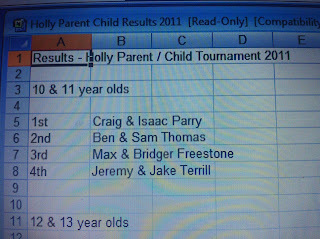 i guess today craig and isaac put together a great game because they won the tournament for the 10 and 11-year-olds. exciting stuff. later in the day, some of us went up to visit the metcalfes at their new house in syracuse. sam and isaac stayed and spent the night. summer is winding down. today was the lakeside jr. golf tournament. 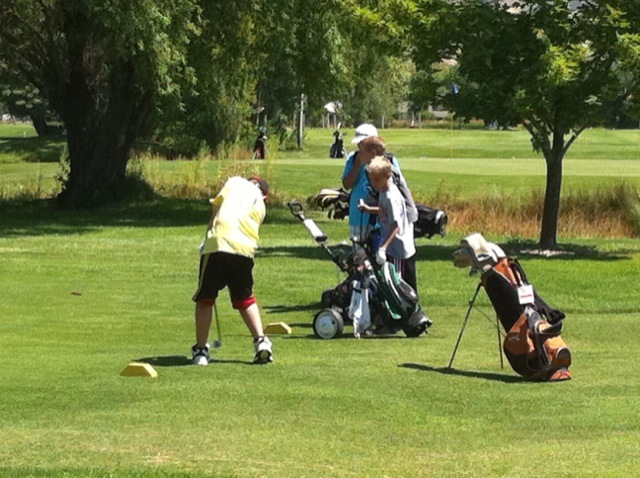 sam and isaac have been golfing at lakeside every thursday with some of their friends in a junior league. the last few weeks are reserved for a tournament, but each group has to bring a scorekeeper. i kept score for sam parry, isaac, sam stobbe and davis stobbe today. it was actually quite pleasant. i bought a coke zero and a subway sandwich, listened to the yankees game with my headphones and took full advantage of the cart (which the players were not allowed to ride in). it really wasn't that hot either. isaac narrowly missed a hole-in-one and finished with the best score of 55. after that, the four golfers were whisked off to cherry hill by natalie stobbe. they topped the day off with football practice, so it sam and isaac were a tired pair last night. caroline returned from her st. george tour today just in time for a darling cut and color. after our shopping day last weekend, i think she's ready for high school (once jake shows her where her classes are that is). 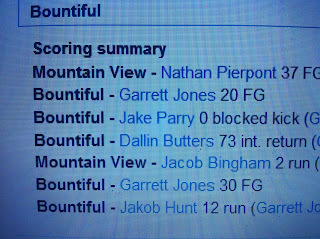 jake is busy with football two-a-days and if he's not playing football he's doing some student body office related thing or squeezing out every last minute he can up on the "boulie" (bountiful boulevard--the ultimate hang-out spot for the high schoolers this summer). it's hard not to think about what evan is doing. it's really fun to get pictures from the mtc so we can at least see what people look like. his time is really short in the mtc now--he's leaving on monday for japan...destination unknown when he gets there. these are all the bountiful high elders in the mtc right now (i think there are a few missing, but this is what they could round up). 4th of july fireside in the mtc. some of evan's district got to carry flags. this is a group of japanese elders and sisters. evan will have to get used to the "peace signs". this is the way the japanese always pose for pictures. jake had student body officer meetings between two-a-day practices today, so i took a hearty lunch down to the school for him. this is the between practice chaos. i'm glad i wasn't in a closed room with all these sweaty bodies. things seemed to go well for the first day. in the morning, the varsity kids practiced defense and jake is getting used to his new position of defensive end. in the afternoon, he rotated in and out at tight end. he came home tired and hungry. isaac and sam also had practice, four hours between them. lucky caroline left for st. george today with four of her cousins, her grandma, her aunt and her aunt's niece (on the other side). 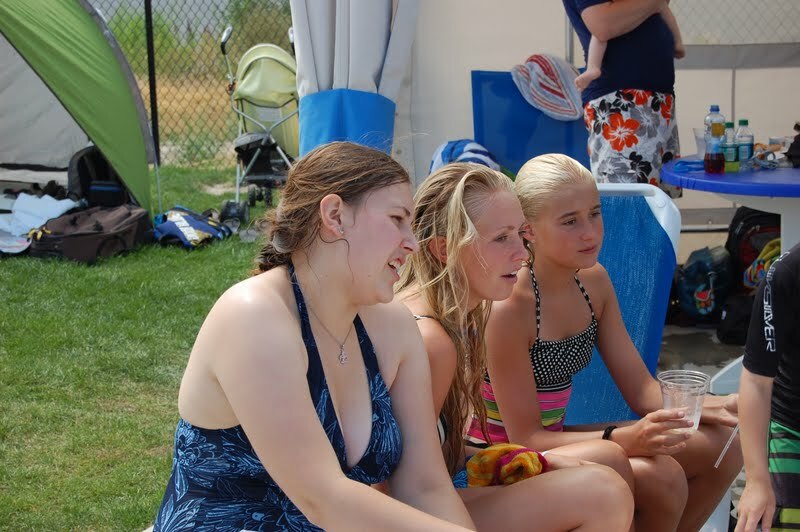 they had big plans for swimming, shopping and seeing two plays at tuacahn. i wanted to go, in fact i was the initial planner, but i have been gone so much and the boys really needed me here to feed them this week. today is a good turning point. everyone is home now for the rest of the summer (which is only two weeks) except caroline is going to st. george for a few days to see some plays at tuacahn. so it's a good turning point. 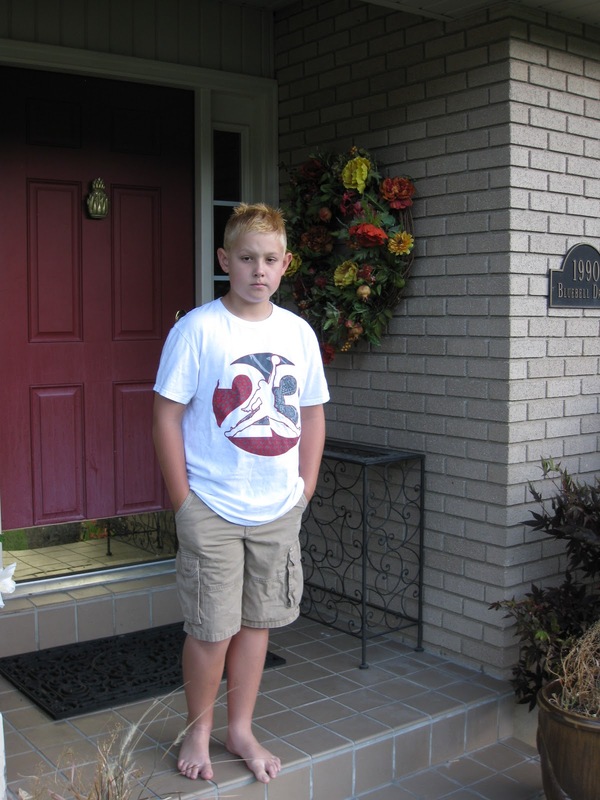 "hell" week starts tomorrow for jake--6-7 hours of football practice all week. football practice starts in earnest for sam and isaac. 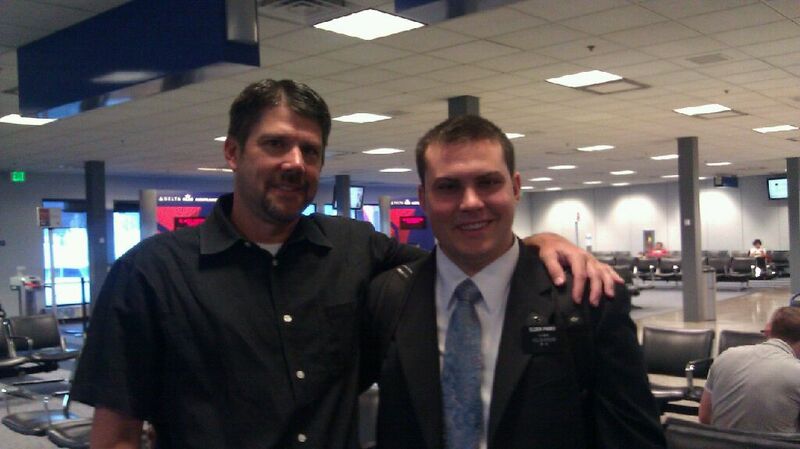 craig is home after transitioning off his colorado case. and i've got to whip a lot of things into shape, including myself. so i'm saying it's a good beginning. the future looks bright. i'm not a big shopper. i don't mind going once in awhile, but back-to-school shopping is deinitely not my favorite thing. having said that, caroline, sam and i hit the outlets on the way home from park city. i have to say that it was a productive trip. caroline got some very cute things for high school and sam loaded up on golf clothes (which can also double for school clothes). we had a fun day too. after that, the yankees and the red sox were on again. we woke up this morning in park city looking for some fun. lucky for us, there are lots of ways to have fun in park city. we started on the alpine slide and then moved to the alpine coaster (my favorite). after a yummy lunch, we went to the olympic park and went on a massively scary and big zipline. the zipline follows the same general path as the olympic ski jump. we finished the day with swimming, sandwiches, and the yankees/red sox game on our ipads. 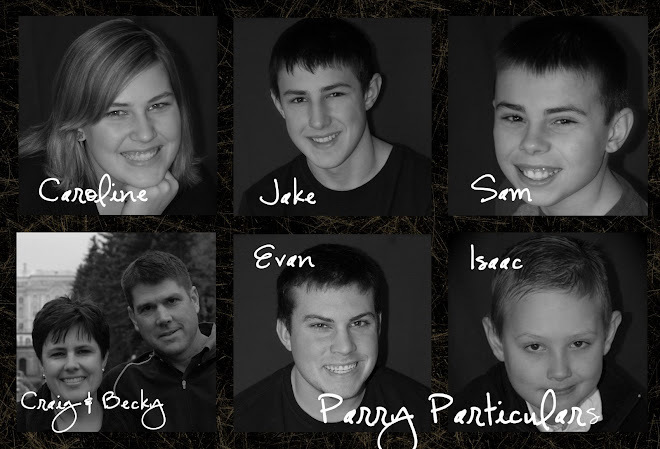 today was the start of the parry family reunion. almost everyone was able to come. we were missing spencer and evan. today we spent a few hours at a water park called cowabunga. the cousins all seemed to have a great time together. later that night, we headed up to park city where we had some condos reserved at the canyons. i came up later in the evening because sam had football practice. we've been on the road a lot this summer. just got home from a week in colorado and now we have to unpack. we got home yesterday around 6:00 and craig is totally unpacked, almost everything is put away. me...not so much. my suitcase is on the floor with dirty clothes spilling out of it. i hate to unpack. craig often jokes that i should just stay packed for the next time i leave town. he likes his way. i like my way. yesterday craig gave isaac his suitcase, told him to walk straight to the downstairs washroom, dump the whole thing in the washer and turn it on. unfortunately, isaac's i-touch was in the pocket of one of his shorts. so maybe, just maybe, my slow, methodical way is okay?